This allows you to import content from other courses or curriculum groups you have joined. The Add Content option can be accessed from the Classroom Curriculum (Plus) – Overview. Once you click Add Content menu, select the appropriate source from the list of available sources at the bottom of the menu (Import from). 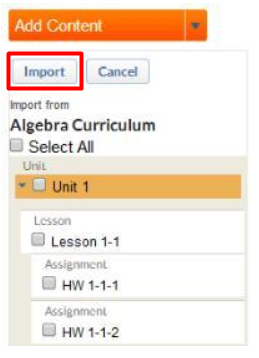 From any source you choose, you may import all contents or you can select a specific unit, lesson, or assignment. When you have selected your content, click the Import button. You can now organize, edit and publish all imported contents. You own this copy of the content, and any changes you make will not be reflected in the courses or curriculum group that contained the original. Whatever you publish in the Curriculum tab is visible to students.